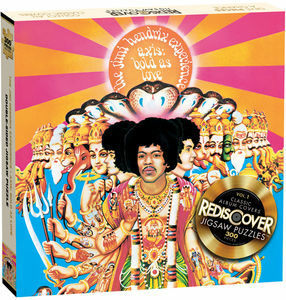 This double sided, 300-piece album cover puzzle features the artwork of both the front and back cover from the Jimi Hendrix Experience album, Axis Bold as Love. Collect all classic covers puzzles and give PIECES a chance. 300 piece double sided puzzle with the front & back original album cover art. The 1967 second studio album by The Jimi Hendrix Experience, Axis: Bold as Love, is an impeccable blend of poetry, psychedelia and pop. The cover, designed by David King and painted by Roger Law, imitates a Hindu devotional poster. Everything about the way Hendrix’s music was mutating and evolving was captured in this vivid illustration. Axis: Bold as Love was one of the first gatefold covers, with front and back art blending into each other in keeping with the seamlessness of the music. The album’s touching ballad “Little Wing” was later covered by Eric Clapton on his Derek & the Domino’s classic Layla album.